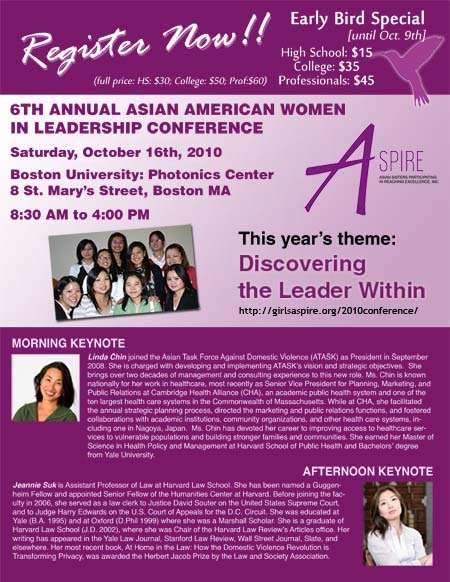 Continuing the trend of putting on a great conference (from what I hear), if you have the time definitely check out the ASPIRE 2010 leadership conference down at Boston University. The 2010 AAWIL Conference aims to encourage attendees to explore, learn, and flourish. This conference will challenge and support Asian American women to take a leap. Speakers will share their experiences on how they were able to discover themselves through new inspirations and experiences which allowed for change in their lives. Build upon last year's theme of "Fearless Leadership: Taking Charge with Confidence"
Celebrate and explore ways Asian American females "Discover the Leader Within"
Get tickets and learn more about the conference down at their site.